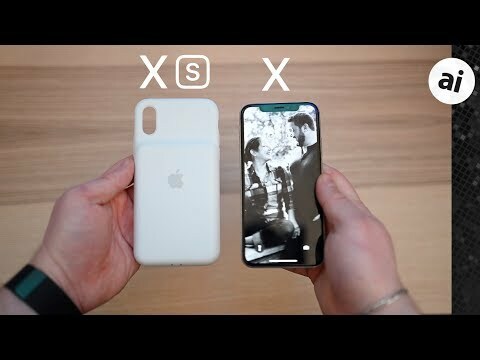 The Smart Battery Case for the iPhone XS physically fits on the 2017 iPhone X -- but how well does it actually work with the older device? AppleInsider puts it through its paces. 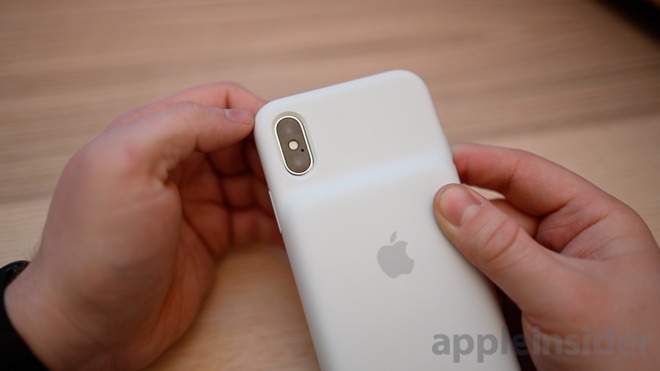 Apple launched a newly designed version of its Smart Battery Case for the iPhone XS, iPhone XS Max, and iPhone XR but left the iPhone X out in the cold -- at least on the packaging. On the surface, this makes sense with the iPhone X being a discontinued device, but unfortunate for those who want to boost the battery longer on their roughly year-old device. 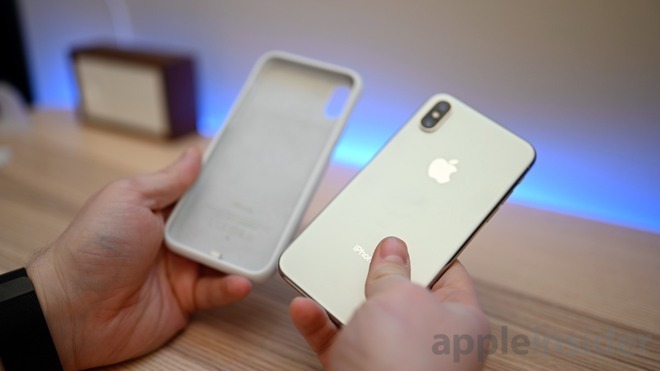 We grabbed the white iPhone XS Smart Battery Case and our iPhone X and put it on to see if it would charge, if it fit, and if there were any other side-effects -- like audio issues -- from using a case that wasn't designed for it. Before everything else, we needed to know whether it would charge. For us, the answer was an immediate yes. As soon as we slid the case on, the phone sprang to life and displayed both battery capacities for our phone and the case. We got no iOS alert as others reported saying it was incompatible, and instead, it just worked. Our iPhone X was running iOS 12.1.2, so things could change with the public release of iOS 12.1.3, though that too is reported to be working at the time of publication. Secondly, we need to make sure it fits our phone. There are a few design changes between the X and XS so this was a bit of a concern. The biggest exterior change is the movement of the camera module which shifted to the left less than a millimeter. When put on, you can see that the exact dimensions of the cutout don't completely line up. There is a small gap to the right and to the bottom of the camera module, while the left side is particularly tight. But, it still fits and the case does not encroach on the camera's line of sight. 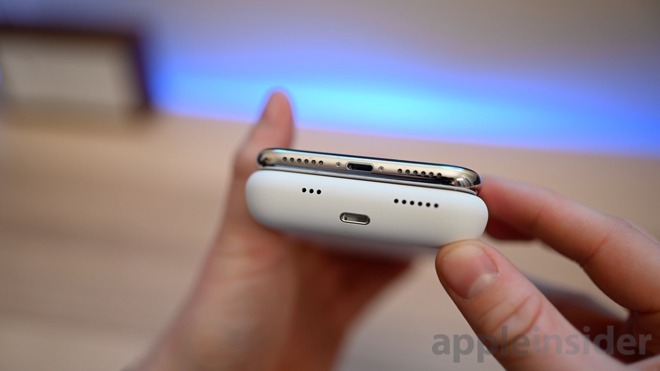 Another exterior change is the ports on the bottom of the phone used for the microphone and speaker. 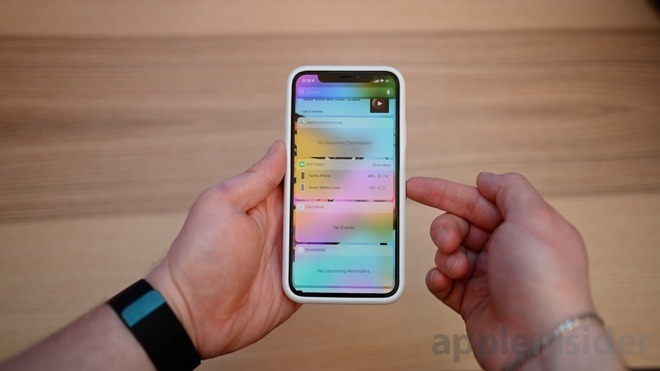 The iPhone X had six penetrations on either side of the Lightning port. The XS has six to the right, but only three to the left. This could block ports and hamper the iPhone's mic or speakers. We first tried the speaker, which is on the right side. To test, we played music with the case on and off and checked for clarity and volume. As these ports largely seem unchanged, we noticed no difference in the acoustic abilities of the speaker. Then we tested the mic, by recording a voice memo with the case on and off, then playing back to see if we could tell a difference. This time, we did notice a small difference between the two scenarios. With the case on, the microphone was subtly muffled. To be doubly sure, we tried invoking Siri with our voice and took a phone call. When on the phone call, the recipient didn't notice a difference until we filled them in on what we were testing, at which point they said that they had notices a small volume change. While there may or may not be a difference in the microphone, it wasn't a large enough discrepancy to cause alarm. It easily works well enough to continue using the case. Apple specifically states on the iPhone XS Smart Battery Case page that it works with the XS, but doesn't mention the X. Our testing shows that it does work, even if the ports don't exactly line up. Knowing Apple's legendary attention to detail, they likely refused to acknowledge support for the iPhone X because of the small differences between the two phones. Apple wouldn't want to say it works with the camera bump being so close and the ports not lining up. Fortunately, many won't care and those have no real impact on usage. 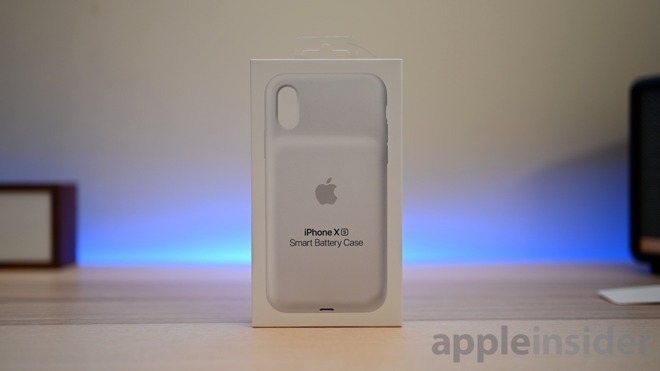 If you want to grab an Apple Smart Battery Case for your iPhone XS, XS Max, XR, or X, you can do so for $129. I wonder how many Apple Smart Battery Cases’s are sold. The iPhone already has fantastic battery life, but if you need more battery life, other brands go for between $20 - $40 on Amazon. Much of this is wrong or misguided. First, those other brands should not be used. To start, they aren't MFi certified. Which means they can easily damage your phone. You don't want to mess around with uncertified power accessories. Second, the ones that do get the MFi cert and are dependable include Mophie and Moment, but of which are north of that $100 price point. That makes Apple's only slightly more expensive than the quality cases. Third, most others don't have Lightning ports, especially certified ones. If they do, they don't work with data or accessories. Apple's lets you use USB adapters, CarPlay, and headphones through the new Lightning port so you don't need a different charger or have to remove the case. Lastly, Apple's is deeply integrated within iOS. They get small effects like the battery capacity displayed on screen and within Notification Center. Your phone also knows it is a battery case and not a charger. When an iPhone is on a charger, power intensive tasks ramp up like backups, updates, image uploads, etc. When an Apple battery case is on, the phone knows and doesn't ramp up power consumption. This actually makes Apple's battery case last longer than the off the shelf ones from shady Amazon brands. Any that support both the X and XS is accidental because they aren't well enough designed to fit the phone, to begin with. They have weak tolerance that will have ramifications down the line. Also, the Apple case supports wireless charging if I remember right. 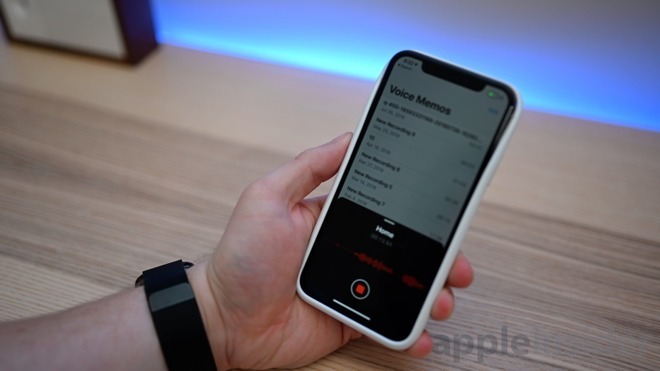 Could a person drill three small holes in the bottom of the case to restore the mic to full capacity on an iPhone X? Are electronics or battery components contained in the “bottom” lip of the battery case, or would the integrity of the case be impaired? This is funny. How many of you use only MF! certified chargers and batteries? I do not care and even while not using certified Apple stuff for several years, my iPhone 5S still works with good battery capacity. I just use Amazon or Apple or some other good brand cables (sometimes very short to hook up to every generic high capacity battery with USB output or wall charger. My take is that you are creating panic and that none of this has any bearing on shortening Apple battery life significantly. The proof is that my current iPhones (5S and 6) lasted 4-5 years with no battery issues. and to be honest I use Apple charger (not battery) only when I travel and there is no other USB with proper source around. Sure I do not leave that running for entire day, but who does? Just keep normal discharge-recharge cycle and proper cable. I do not care about fancy case. Most of them are not even practical for my use as they keep screen open and I do not run my life with device in my hand - that has to be in pocket aor in bag when not used so screen has to be covered in some protective case. I've never purchased or used a cable or charger that was not MFi certified. Verify that cellular or WiFi signal strength isn't reduced by putting the case on. We don't know if the antenna design changed between the X and Xs and the case might interfere with the X antennas, which would be a VERY GOOD reason for Apple to not certify the case for the X.
Verify that the wireless charging OF THE PHONE isn't impacted. Like the antennas, we don't know if the Qi charging coil in the X is different from the Xs; changes may have been made to the Xs to allow this case to work, for instance. For that matter, it's possible that the Xs' charging coil isn't even used when the case is installed, and the necessary hardware/firmware to handle this might not even BE in the X. It isn't the charger that is always the issue, but the cable. Most chargers out there are fine and Apple doesn't certify many of these. They dont include any proprietary components, unlike Lightning cables which the actual connector is purchased directly from Apple. If they don't, they have to make their own which can be dangerous. Almost every single Lightning cable out there is MFi certified because Apple has any non-licensed ones removed as soon as they see them. Whlie you don't use any Apple charger, you are using an Apple certified cable. The antennas have not changed between the X and XS, so that doesn't have an impact. Second, the coil has no impact here. It isn't used at all. The case itself has a coil built into it, therefore the status of the coil in the phone doesn't matter. We didn't overlook them, they just aren't concerns and not worth testing. Same, I would never use non-MFI. The person you replied (I must have blocked him for low-value posts) seems to have trouble understanding non-MFI doesn’t mean you WILL experience a fire or short, but rather than MFI means you won’t. Hello Andrew, look up “concentric”. Cheers! The people on AI are significantly more educated than the general population I’d be willing to bet that the vast majority of the general public has no idea what MFI means, so even though there’s clearly a benefit, it’s lost on many/most people. Other battery cases do not work the same. When you use the apple smart battery case, it is tightly integrated with IOS so it shows up and uses that first and THEN your regular battery. It also knows it is on the smart battery case, so things like backups and other power intensive things do not run. If you use ANY other battery case or any of the battery packs, the phone assumes you are plugged into electric so it runs the power intensive things that should not be run. 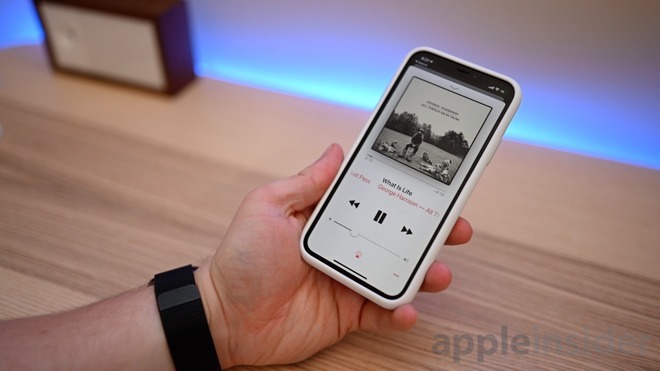 Also other battery cases do not allow lightning headphones or CARPLAY.